"Lafayette Garden Club Bridge Memorial Garden Daisy Scout Project"
Henrietta Boriskie, Daisy Scout Chairperson. provided plants, mulch and garden soil for this Daisy Scout planting day. this Vermilionville Daisy Scouts project in May 2010. Co-Chairs Sarah Schoeffler and Julie Haack. Committee: Mary Toce, Claire Moody, Jan Wyatt. by Lafayette Garden Club under the direction of Honorary Gardens Chair Mary Toce. 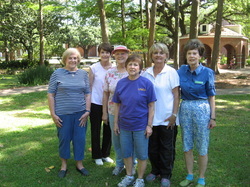 Scouts and Garden Club Committee in May 2010.